… I used to believe in the power of sci­ence to make the world bet­ter. And I’ve spent my entire life watch­ing peo­ple in power reduce the public’s opin­ion of sci­ence to the point where more peo­ple in the U.S. ques­tion evo­lu­tion than believe in it, which to me is basi­cally on par with dis­be­liev­ing grav­ity. The wealthy have attacked the public’s faith in sci­ence because it would have cost them money for us to believe that the planet’s cli­mate is being changed by their indus­tries. An entire polit­i­cal arm of this coun­try dis­trusts the notion of experts. The only sci­ence they care about is that which allows them to wring more money from the world. Where’s my opti­mism? Where’s my abil­ity to write sci­ence fic­tion like “The Kansas Jayhawk vs. The Midwest Monster Squad?” Where did I leave it? And would it be delu­sional of me to even try and adopt it again? That’s the thing, isn’t it? If you’re a pes­simist and your pes­simism doesn’t come true, you get to be happy along with the opti­mists. But if you’re an opti­mist whose pre­dic­tions prove false, then there’s lit­tle to be happy about. The pes­simist at least gets the grim sat­is­fac­tion of being right. Even if they’re no hap­pier about the out­come than the optimist. Jeremy mentions a video (clipped from a rather good documentary on stats from the BBC which I watched late last year) which was linked to in the comments thread of another post by Mike Brotherton; it covers (in a flamboyant data visualisation style) the sort of points I try to make a point of repeating to myself like a mantra on a regular basis: yes, on a day-to-day level, life seems pretty tough and the world looks to be high-tailing it to hell in the proverbial handbasket, but when you look at the aggregate experience of the human species over a comparatively short span of time, things have consistently improved, and show every sign of continuing to do so (paradigm-breaking Outside Context Problems or existential risk events notwithstanding). Indeed, sometimes I think our capacity to worry about the future is the strongest indicator that the here-and-now isn’t anywhere near as bad as it could be. And the more I think about it, the more I become convinced that optimism isn’t just hard work, it’s scary: it invites disillusionment, it openly courts the up-ending and down-throwing of one’s conceptions of the world. To maintain optimism, one must keep picking oneself up after the arrival of a disappointment, rebuild a new theory of the world, adjust and amend it as new data comes to light. By comparison, pessimism is easy: sit back, shake your head stoically as you predict bad things to come, and then just open a newspaper or web-browser and pick out the evidence to prove you were right. People are a lot like electricity, in that we tend to follow the path of least resistance. Pessimism has a nice fat copper cable strapped straight to the psychological earth-point; the gratification of being proved right, gained with minimum emotional expenditure. As a result of that, pessimism seems to be the more popular stance, at least at present; it therefore follows that optimism is unfashionable, not to mention easily undermined by pointing to all the short-term badness in the world. Hence optimism becomes harder still to maintain: you’re flying in the face of popular opinion, and that’s rarely a fast route to popularity and choruses of agreement. Furthermore, I think optimism contains a component of agency – a feeling that things can be changed, and changed for the better, by doing stuff. Pessimism is predominantly fatalist, as the responses to my post about the Giffords shooting demonstrate very clearly: thinking that we can change the tone of political discourse is naive and condescending! The corporations and politicos have got it all sewn up, and there’s nothing we can do but ride it out and hope the powers that be fix it so we come out a bit better than Those People Over There (whether Over There is the next neighbourhood along, North Korea, or any other strawman enemy-of-the-moment; doesn’t matter, really, so long as there’s some way to make it look like you deserve better than they do). But just look at history: we have changed the tone of politics, many many times over, and we will do so again. And those who change it will be the ones who didn’t just sit back and sigh, imagining the inevitable dystopia just around the corner. This is not a partisan point, either: activism works. But it’s also work. I’m reminded of the apocryphal slogan of Generation X (the source of which escapes me): “Can’t win, so why try?” Maybe that’s why being optimistic is a struggle; perhaps it’s just generationally out of fashion. Of course, this is all easily portrayed as conjecture and hypothesis on my part, mixed with a generous handful of self-justification… and maybe that’s what it is. Perhaps pessimism really is the more rationally valid and sustainable attitude: after all, the universe is a machine for creating entropy. But I’m going to struggle on being optimistic as best I can, regardless: for one thing, my mind needs the exercise. Get yourself over to Pink Tentacle right away; they’re hosting a bunch of mega-engineering promo images and design concepts from Japan’s Shimizu Corporation, who plainly aren’t afraid to think in directions with strong science fictional undertones. Directions such as floating lily-pad cities, million-citizen pyramidal cities, space hotels… and turning the moon into a gargantuan solar power station. 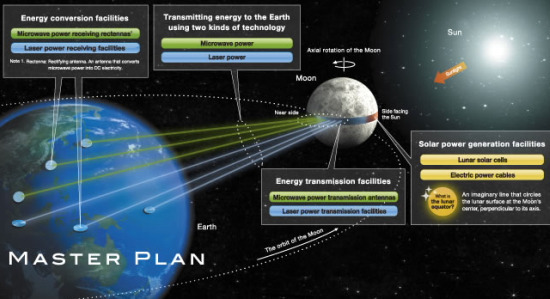 This one’s the winner for me, because any image of a planetary satellite re-engineered into a solar power plant that has the words “MASTER PLAN” masked onto it in large letters is, by any sane and reasonable metric, better than pretty much any other image. Of anything.